20 March – Gladwin Mzazi from Gauteng North has become the 6th fastest man in South Africa in the men’s 5000m at the first Yellow Pages meeting of the series in Stellenbosch. This after Mzazi won in 13:24.50, just 4 seconds shy of the Olympic Qualifying A-standard. Only Shadrack Hoff (13:14.16), Sydney Maree (13:20.63), Alistair Cragg (13:22.07), Juan van Deventer (13:22.64) and Hendrick Ramaala (13:24.43) have run faster times. Mzazi has improved significantly over the last couple of weeks. 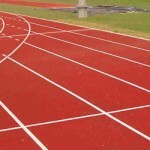 On 25 February in Germiston at the first Yellow Pages Interprovincial the 23 year old ran 14:01.81. A week later he improved his personal best in Bellville when he won in 13:28.25 and now in Stellenbosch again. Mzazi and Gelant were both looking for the 13:20 time needed as the first of two A-standard qualifiers (one local and one international), but have not yet laid their claim on the Pot of Gold. (Yellow Pages has made available an incentive worth R200 000 for athletes who achieve the A qualifying standard for the London Olympics.). Tony Wamulwa from Zambia was included in the line-up to help the duo run a fast race. Stephen Mokoka did not compete due to injury. Elroy Gelant led the race from the start with Wamulwa pushing hard and Mzazi not far behind. The trio was on pace for most of the race but starting losing valuable time in the last 3 laps. Going into the last 2 laps, they were 6 seconds off the pace, but still on track to reach 13:20. The final lap however was slower and not even a sprint in the home straight between Mzazi and Gelant was enough. In the end Gelant slowed down and Mzazi won the race. Gelant finished in 13:25.98, his fastest yet this season after running 13:45.65 in Bellville and breaking the SA 3000m record at the World Indoor Championships in Istanbul from 9-11 March. Gelant also competed at the Africa Cross Country Championships on Sunday where he ran 12km. Wamulwa fell in the home straight and finished 3rd in 13:28.17. The 400m women’s race was one of the highlights of the evening with Estie Wittstock making her first appearance of the season and Sonja van der Merwe, Eugenie Wicksell and Mareike Wolhuter in the line-up to name a few. It was however none of the regulars dominating the race as Rorisang Rammonye won in 51.98sec, a new personal best for her as her previous best was in Germiston (25 February) recorded at 53:01sec. Rammonya’s 51.98sec is just short of the 51.55sec Olympic Qualifying A-Standard. 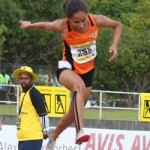 Tjipekapora Herunga from Namibia finished 2nd while Sonja van der Merwe improved her personal best (54.04, Durban 2012) with her 3rd place finish in 53.53sec. In the same event for men SA Record holder Ruben Ramolefi easily won the race in 8:27.58, just shy of the 8:23.10 A-Standard. Ramolefi was just in a class of his own with not even Ugandan athlete Javob Araptany catching up with Ramolefi. Dean Brummer finished 3 sec later in 8:30.62 for a huge new personal best. Araptany crossing the line in 8:31.15. A repeat of Yellow Pages Stellenbosch will be broadcast Sunday, 25 March from 13:30-14:30 on SABC 2. 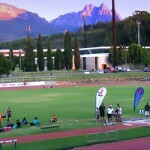 The next leg of the Yellow Pages series will take place in Potchefstroom on Saturday 24 March 2012 with Sunette Viljoen, who recently reached the Olympic Qualifying A-standard in the javelin throw to compete. Just a correction in the article above is that Alistair Cragg has actually run 13:03.53 while competing for Ireland and is by far the best 5000m runner which South Africa never had. On the other hand Sydney Maree was competing for the USA when he ran his 13:22 so you can safely eliminate two names from that list making Mzazi the 4th fastest of all time.